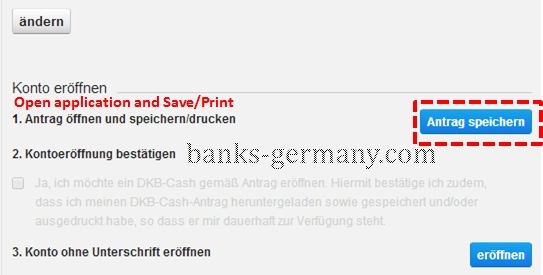 DKB bank is arguable one of the best banks in Germany and having an account with DKB bank has many benefits, such as free VISA card, free cash withdrawals worldwide etc. (read more about benefits of DKB bank here). However, DKB bank is selective is accepting new accounts. 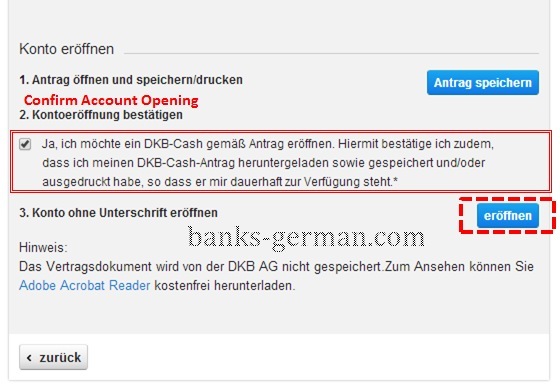 Therefore, this guide provides you with information on how to open a DKB bank account for residents in Germany. Click on the button at the bottom of the page which reads “Jetzt DKB-Cash eröffnen” (Open DKB-cash Now) to open the online application form. Fill the application form online. You will require details as required below. Provide your correct details as it will be printed on the form and you cannot change it at a later date. 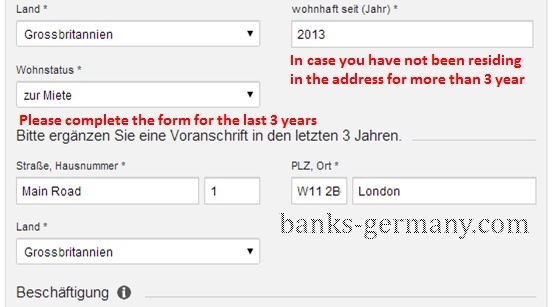 If you had moved address in the last 2 years then your previous address is also required. In case you have not resided in the present address for more than 3 years, you will have to provide your previous address. Agree to the terms and conditions for DKB-Club policy. Check if the details entered are correct. If not, click “andern” to change the details. If the details are correct, then download the filled up application form. Once the application form is generated, the next option is activated. 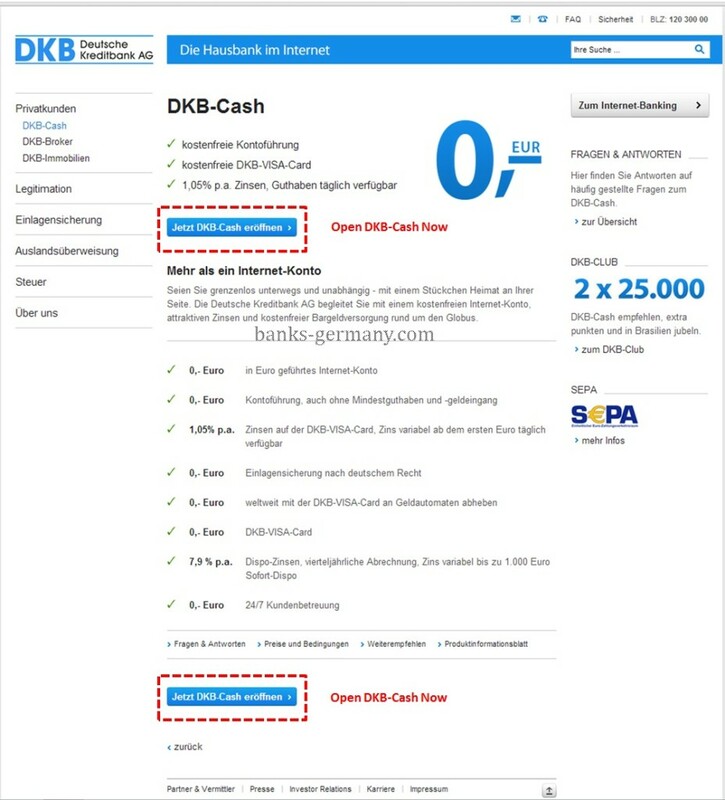 Confirm that you need to open a DKB-Cash account by checking the box. 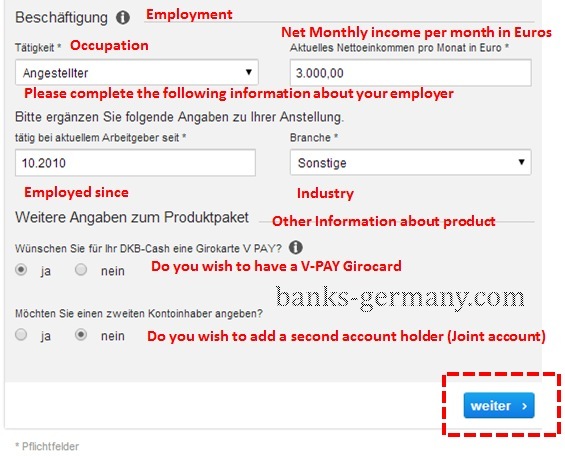 Now click on “eröffnen” to securely submit the application online. You will then get the last page confirming that the application was submitted. Take the filled up form and the below documents to the local post office for PostIdent. For non-EU nationals include copy of your resident permit or Visa. Take the above documents to the nearest post office in person. The clerk at the post office will verify if you are the person as mentioned in the application form and on your passport. Step 7 : Once the documents are checked by the clerk at the postoffice, you have to sign the document at the necessary place in front of the clerk. This signature is verified with your signature in your identity documents. 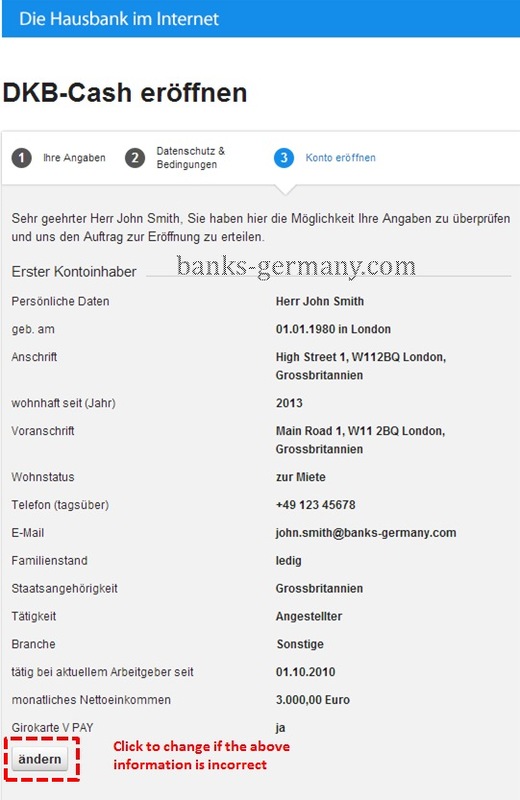 After verification, the documents and signature, the forms are then put in an envelope and sent to the DKB headquarters for checking the account. Step 8 : You will receive an email if further documents are required. These can be sent by email too. Then you will receive a decision by email if your account is opened or not. If you were successful in opening a DKB bank account, further documents will be sent to you by post in the following days. The clerk at postoffice just checks if you are a valid person and that the document you sent are verified. 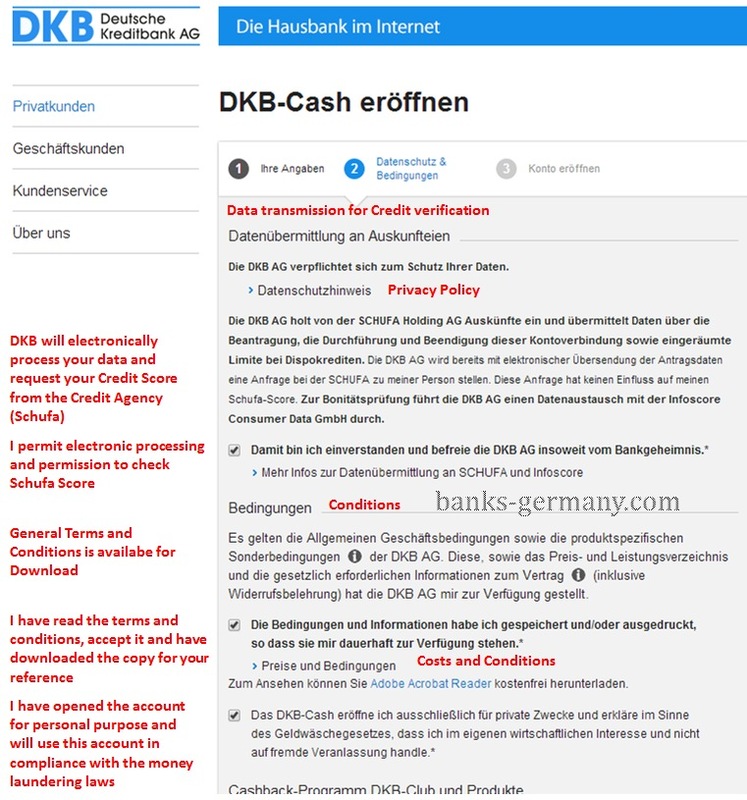 The final decision on the opening account is made by DKB bank. 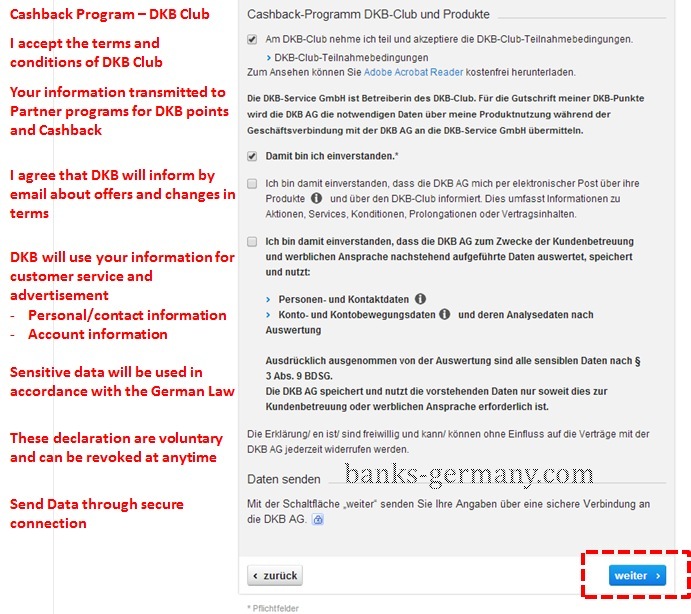 DKB is very selective in opening new bank account, so if you are a foreigner living in Germany, though not necessary, to facilitate fast processing of your application, it may be advantageous to provide all the documents you can to substantiate your application, such as a good job contract, long term resident permit, good income etc.